APP took a direct hit last year when several of its suppliers were identified as having fire “hotspots” in their concessions. While APP steadfastly denied that its companies set the fires, it was nonetheless singled out in Singapore, resulting in some stores removing its products removed en masse from shelves and the government threatening multi-million dollar fines. 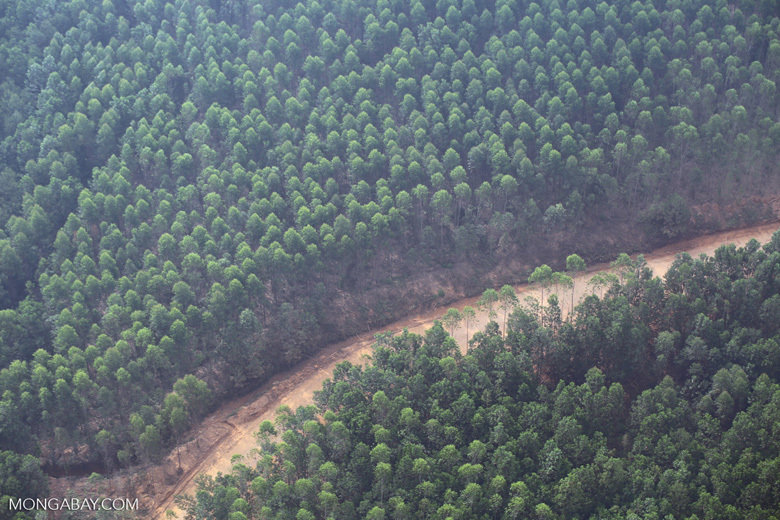 APP’s Aida Greenbury discusses the company’s efforts to turn its business model away from deforestation toward better managing natural ecosystems. Last year some two million hectares of land in Indonesia went up in flames across Sumatra, Borneo, and the Western half of New Guinea. The conflagrations caused choking air pollution, hospitalizing hundreds of thousands of people and further denting regional economies already hard hit by the downturn in commodity prices. Daily carbon emissions from the fires during the height of the crisis were higher than the daily emissions from the entire U.S. economy. 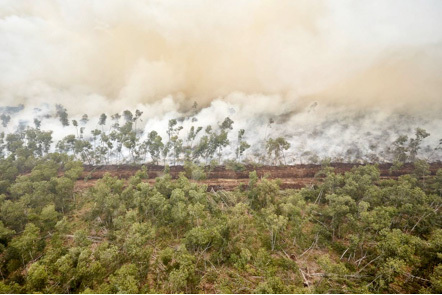 Most of the haze was caused by fires burning on degraded peatlands. While healthy peatlands are akin to wet sponges, dried-out peatlands are highly vulnerable to fire. And once ignited, peat fires are nearly impossible to extinguish using conventional fire-fighting techniques. Only sustained rains end the burning. With the prospect of dry conditions returning to the region soon, Indonesia and its neighbors are bracing for another round of fires that could be even worse than last year’s Armageddon, which some observers called the worst environmental disaster of the 21st century to date. That prospect is terrifying not only the region’s governments and citizens, but also the companies that operate concessions in Sumatra and Borneo. And perhaps no company is more exposed than Asia Pulp & Paper (APP), a forestry giant that sources wood pulp from dozens of suppliers operating across hundreds of thousands of hectares of peatlands. APP took a direct hit last year when several of its suppliers were identified as having fire “hotspots” in their concessions. While APP steadfastly denied that its companies set the fires, it was nonetheless singled out in Singapore, resulting in some stores removing its products removed en masse from shelves and the government threatening multi-million dollar fines. The irony, however, is arguably no Indonesian company is doing more to atone for past sins than APP, which since early 2013 has embarked on an ambitious effort to remake how it does business, including implementing a ban on conversion of forests and peatlands for new plantations, establishing protocols for curbing conflict with local communities, and pledging to support landscape-level conservation and ecosystem restoration initiatives. Still, APP’s legacy is not easily reversed as the recent outbreak of fires clearly demonstrate. While APP may not have ignited the fires, traditional plantation management practices created conditions that enabled fires to burn. 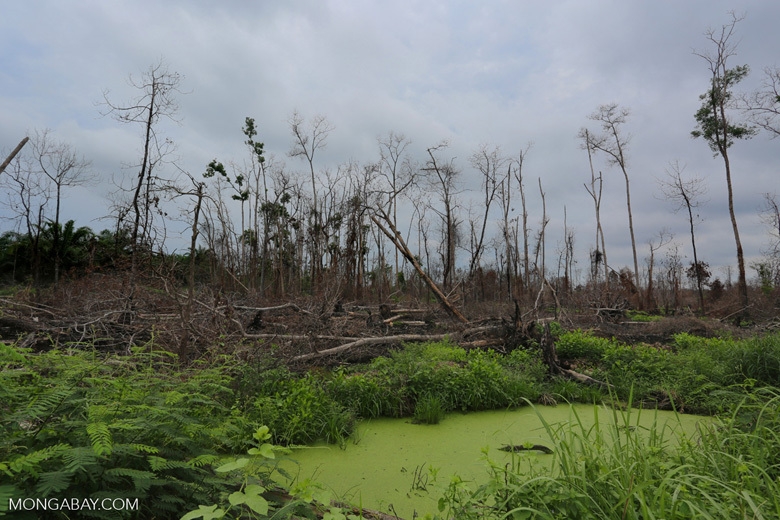 For example, draining peatlands — a practice widely used across the plantation sector, including the wood pulp, timber, and palm oil industries — dramatically increases the risk of burning. Fires lit well outside concession areas can easily spread into plantations as well as adjacent forests stressed by drainage and dry conditions. So merely stopping deforestation won’t be enough for APP to eliminate its fire risk. It must restore the basic ecosystem function of the areas where it operates: namely raising water levels in peatlands. Accordingly, on the third anniversary of its forest conservation commitment, APP outlined how it is beginning to do just that. At an event in Jakarta on Thursday, APP highlighted three peatland restoration and management initiatives: the construction of more than 3,500 dams to rewet drained peatlands, retirement of 7,000 hectares of active plantations, and the establishment of an independent foundation to support peatland conservation. It also announced a new fire prevention and management strategy as well as a program that encourages local communities to move away from land use practices that often involve burning. The stakes are high for APP: beyond the potential legal exposure for last year’s fires and the damage done to its recently-rehabilitated image, it could lose tens of thousands of hectares of concession lands if the central government decides it will strictly interpret President Jokowi’s new peatland regulations. Under a worst case scenario, fiber supplies for APP’s newest mill could be jeopardized. APP, of course, wants to avoid that outcome and its new initiatives create a sort of a paradox for the Indonesian government. While APP may be legally responsible for fires that burned in supplier concessions last year, it is also perhaps best positioned to actually solve the problem given its investments in these new programs and partnerships as well as the shortcomings of previous government reforestation and restoration projects. Where things go from here remains to be seen, but APP isn’t wasting any time in pushing forward. Greenbury responded at length to these issues, the challenges APP faces in dealing with fire, and more during a question-and-answer exchange with Mongabay. 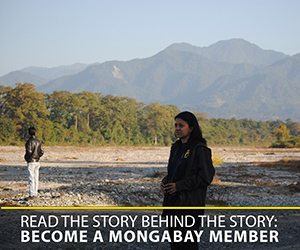 Mongabay.com: In your view, what are APP’s biggest achievements since establishing the FCP? Aida Greenbury: What we’ve achieved over the last three years is to use elements of the FCP as the building blocks to achieve the creation of a new business model which allows us to increase productivity while protecting forests and embracing the community as an integral part of our supply chain. We hope this business model can be the basis for securing better livelihoods for future generations whilst protecting forests at the same time. Our biggest achievement as part of this process is also the biggest challenge. This is the missing ingredient the importance of which neither we nor other programs funded by government (including REDD+) had realized before, and that is that the fates of private companies and local communities in the landscape are intertwined. The private sector and local communities are the two groups with the biggest stake in ensuring the sustainability of forest landscapes. Firstly, for the private sector, the landscape is our investment, and we have the most to lose if it is degraded. So it is in our interests to be responsible stewards. Secondly, for communities, the problem to date is that they have been treated as objects. What APP wants to do differently is to treat communities as our partners and to embrace them as an integral part of our supply chain. We recognize that our own productivity and wellbeing and that of the communities living in and around our concessions are linked. So that is why we have launched our integrated agroforestry and farming program, to provide alternative livelihoods and decrease the threat of forest destruction. We’re also proud of the fact that national and international stakeholders now see the seriousness of our commitments. We’ve been involved and led initiatives such as the New York Declaration, the Bonn Challenge, the Tropical Forest Alliance and the Australian Asia Pacific Rainforest Recovery Programme (APP is chairing the private sector roundtable element of this initiative). We were the only private sector company to be involved in the Bonn Challenge, as part of which we submitted our commitment to restore and protect 1 million hectares of forest across Indonesia, as well as our ground-breaking peat management strategy and the first instance of a commercial company deciding to retire a producing plantation in order to protect the environment. Mongabay.com: Did you have models to follow in developing these initiatives or are you breaking new ground? Aida Greenbury: When we inked the FCP in 2013 of course we realized the commercial impact of the policy on our supply chain and how hard we would have to work to transform our business. We had no blueprints in our hands. We felt like we were jumping off a cliff – and growing wings on the way down. But we were lucky because on the way down we had good partners to assist us such, people like TFT and Greenpeace, world leaders in sustainable tropical forest management who played an integral part in shaping and helping us to implement our FCP. We are pleased that the movement we helped to pioneer has now spread more broadly across the forestry sector in Indonesia – from palm oil to other pulp and paper companies. We hope that stakeholders can learn from our journey and achievements and that these learnings will help to ensure higher standards in forest management, environmental protection and carbon reduction in Indonesia and beyond. Mongabay.com: The release says you’ve allocated 600,000 ha in supplier concessions for conservation and restoration. What percentage of your concession area does this represent? What about the percentage of planted area? Existing ecosystem restoration concessions under APP: 8,300 ha. Ecosystem restoration concessions currently being processed: 44,200 ha. This amounts to a total 660,500 ha. Mongabay.com: APP and its suppliers got a lot of heat during last year’s haze crisis for fires burning in South Sumatra. Has APP made progress in determining the origin of these fires in terms of where they started and who lit them? Aida Greenbury: In 2015 our commitment to forest conservation underwent a setback due to fires. Aida Greenbury: Indonesia and APP were informed El Nino was coming. Within APP’s supply chain, we had started to block canals and to retire critical peatland areas (a major announcement was made in August 2015). What we didn’t know was the extent of El Nino. We were not prepared for it to hit so hard. It wasn’t just us: others around the world were also unprepared, as you can see from the fires that raged from North America to Australia. This shows that forest fire is an environmental challenge for the entire world, not just for Indonesia or for APP. That is why we need to work together to develop a global strategy for tackling fires. Throughout the second half of last year the whole team at APP worked tirelessly to put out the fires, but firefighting cannot stop when the skies turn blue, and we are committed to working with all stakeholders to find a long-term and sustainable solution. The causes of fires are complex. Social, economic, political and environmental factors all have a role to play, and much of this is beyond the direct control of APP and other companies. A snapshot of satellite images cannot tell the full story. From the full set of chronological satellite images, you will see that the majority of fires burning on APP’s suppliers concessions were started outside or in the areas accessible to external parties (there are no fences around our suppliers’ concessions). Then there is the problem that APP is actually unusual in having made maps of its concessions publicly available, something most other companies who also face the problem of fires have not done so. Systemic challenges like land conflict and absence of alternatives to slash and burn agriculture contribute to the problem of fires. Mongabay.com: Would a wood fiber operator ever have any reason to light a fire, for example to clear an underperforming patch of acacia? Aida Greenbury: APP has a clear no burn policy in place since 1996. Any supplier found to be in violation of our policy will be disengaged. Would a wood fiber operator ever have reason to light a fire, for example to clear an underperforming patch of acacia? The answer is no, because even if a certain area is underperforming, it still does not make economic sense to set fire to it when you have invested between $1500-$2000 / hectare to plant that area in the first place. A supplier will always get more for selling their wood than for burning it. 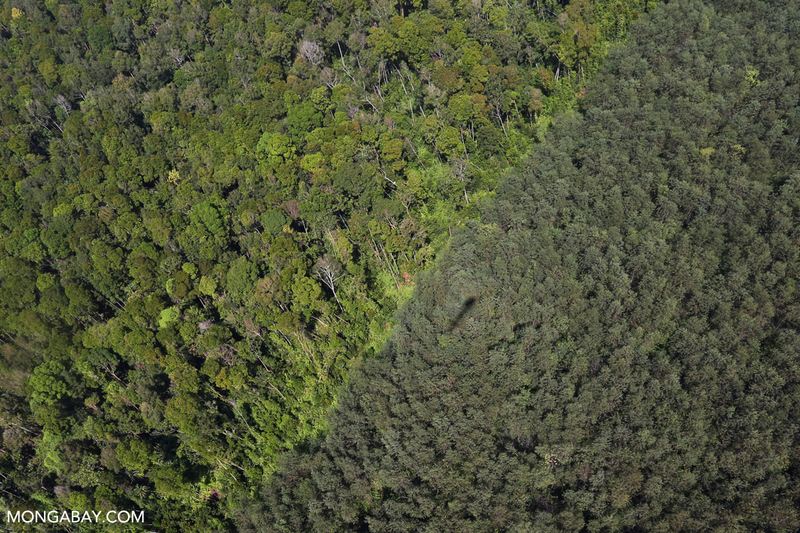 Mongabay.com: APP has consistently complained about “encroachment” into concession areas and its legal forest reserves. Is the government helping with this issue? And are there agencies or levels of government that are more proactive than others? What could be done to better address this issue? Aida Greenbury: We continue to support local and central government in addressing the deforestation issue. That’s why in 2016 we are rolling out our integrated farming and forestry program because improving the welfare of the community and embracing them as an integral part of our supply chain is the solution to this issue. 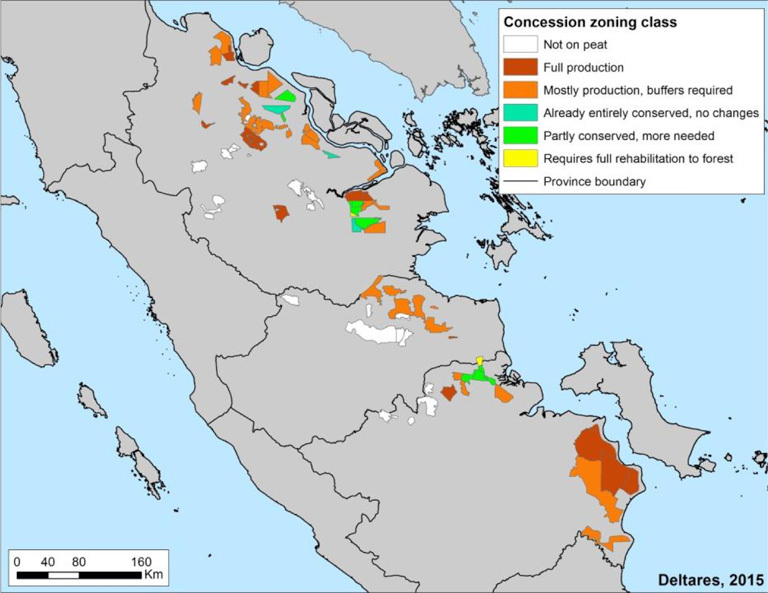 Mongabay.com: Has the decline in palm oil prices had any noticeable impact on encroachment into APP’s concessions? Or is any effect counteracted by the dry el Nino conditions? Aida Greenbury: The decline in palm oil prices has really only set in over the last 18 months, so I have not seen any data on its impact on incidences of encroachment. As a general comment, the economics of the landscape are complex and multi-faceted: irresponsibly managed palm oil is the number one commodity which has an impact on forests. But the relationship between price, supply and encroachment is complex. APP is working with partners including the government of Norway and IDH the Sustainable Trade Initiative to gain a better understanding of the economics of landscape management in Indonesia, and the incentives for different commodity companies, smallholders/communities and local governments. One of the objectives of our integrated agroforestry and farming program is to provide alternative livelihoods for the communities combining plantations and cash crops and farming to increase incomes for the community to compete with palm oil. That way, the community can still improve their livelihood whilst respecting the zero-deforestation policy. Undoubtedly El Nino is a global phenomenon that has significantly exacerbated the impact of fires over the last 6 months and will continue to present challenges for us over the coming months. Mongabay.com: APP has built over 3,500 dams since last year. Do you expect this to significantly reduce fire risk and occurrence? Aida Greenbury: Yes I hope so! The logic is simple: wet peat will not burn. The challenge is around monitoring. Indonesia has a vast system of interlinked canals: how can we monitor the water level and the hydration level of the peatland across the full landscape? That’s the question. Hopefully by building these dams we can show other stakeholders how this system of fire prevention works in practice. In basic terms it all depends on monitoring of water levels. APP field staff will take responsibility for this within our concessions, but what happens outside is up to other players. Technology could also play a role and I hope that we will see the emergence of new technologies that can help to monitor water levels. Mongabay.com: Why is APP funding a community agroforestry initiative? Will this help reduce fire risk? Or are there other motivations? Aida Greenbury: It is obvious that Business As Usual doesn’t work anymore. The growing incidences of forest fires, biodiversity loss and land conflict are evidence of this. What we need is a new business model for landscape management in Indonesia and APP wants to play a role in creating that model. Of course a major motivation in developing this model is to prevent forest fires, but we also have other motives. The first is to protect our investment against other threats including encroachment and land conflict. The second is to work more closely with the community and provide them with alternative livelihoods such as the mix of plantation of cash crops and farming which will provide them with short, medium and long-term forms of income. We want to do this because we have realized that we can only flourish if our communities do. 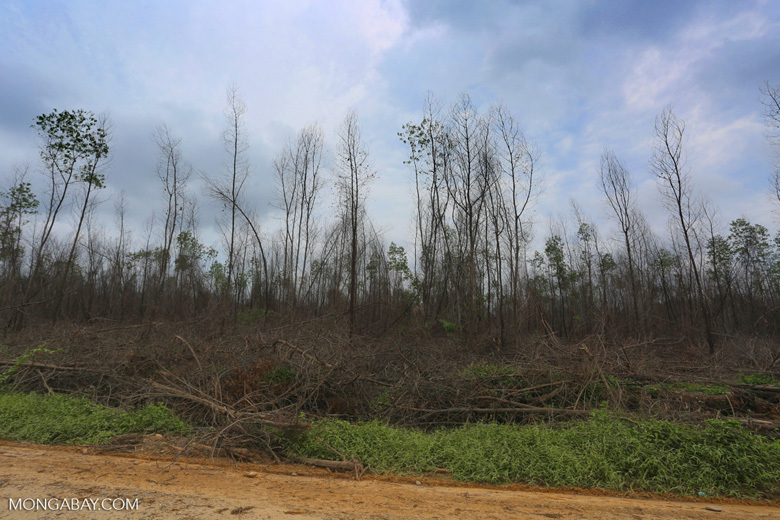 Mongabay.com: A large area of APP supplier concessions — especially in South Sumatra — are potentially at risk from the proposed peat regulation. How is APP responding to this regulation? Does APP support specific targets for drainage depth? Aida Greenbury: The Indonesian government guidelines under its peat regulation are not yet clear. We fully intend to abide by the guidelines once they are available. APP has been working with key stakeholders in best practice peat management such as Deltares and Mott MacDonald. We hope this 2 year exercise in the development of peatland best practice can contribute to the government’s national strategy for peat. Mongabay.com: ForestHints.news reported that the central government is taking over burned areas within APP concessions — possibly 175,000 ha — and restoring them to peatlands. Can you confirm that? If not, what are the plans for these burned areas? Aida Greenbury: We are still seeking clarity from the Government on the status of the burnt land. Mongabay.com: Is APP evaluating other species that could replace acacia if a higher water table is mandated or becomes necessary due to environmental problems? Aida Greenbury: The answer is yes. [APP has initiated] a four year program for alternative species development – supported by Euroconsult Mott MacDonald. Year 1 focuses on the species component, selecting species suitable for wetlands and for pulping. Mongabay.com: APP announced training of 400 APP staff members in fire management, does this cover all suppliers? Aida Greenbury: Yes, but this will be done in stages. To start with we are focusing on fire prone areas that will be affected by El Nino this year, namely East Kalimantan, Jambi and Riau provinces. Mongabay.com: Do any of these new initiatives apply to companies that are “independently owned” suppliers? Aida Greenbury: Our FCP and landscape approach apply to all suppliers to APP. Mongabay.com: How is the peat mapping exercise progressing? Aida Greenbury: We are on track. All LiDAR data analysis should be finalized by the end of Q1. 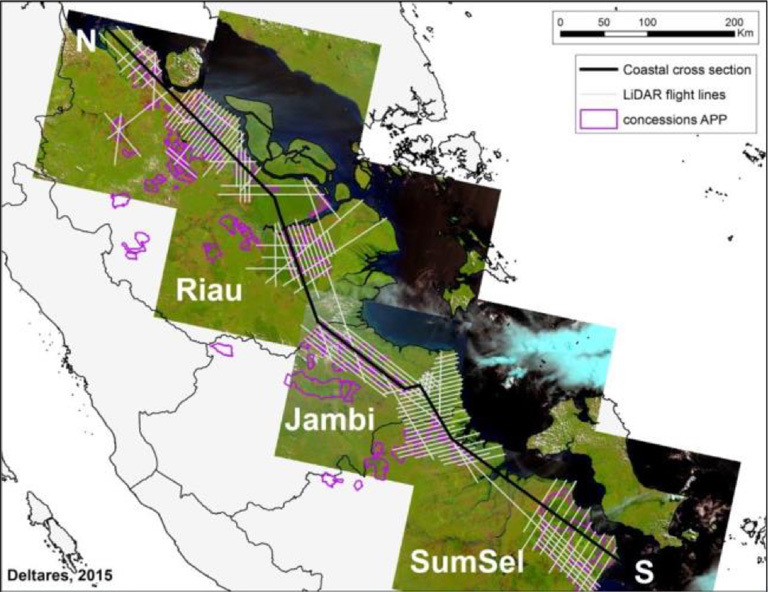 The digital terrain modeling of key peat landscapes in Sumatra has also been completed, and the final results will be shared with the Government of Indonesia. Mongabay.com: APP has put up seed capital for the Belantara Foundation. How do you envision it being funded in the long-term? Aida Greenbury: We conceived the Belantara platform as an innovative means of channelling public and private financing to landscape conservation activities on the ground in Indonesia. The design and mission of the Foundation builds on APP’s experience of working with government and non-government actors on landscape-wide conservation and restoration projects in Indonesia. It seeks to draw on the partnerships that APP have established with government funded programs such as Norway’s International Climate and Forest Initiative and the UK’s Multi-stakeholder Forestry Programme, with the aim of finding synergies with these programs and collaborating with these actors in landscapes across Indonesia and hopefully to expand it. APP’s commitment to Forest Conservation Policy and its willingness to mobiles its own funds will de-risk some of these projects for donor governments to unlock public financing. That is why we have seed-funded the foundation. 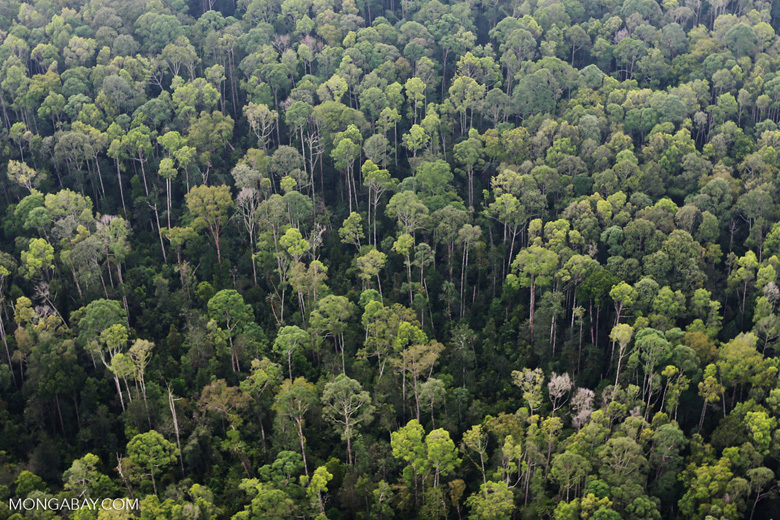 Belantara’s mission will be to provide a direct channel to protect and support Indonesian forests for the billions of dollars of financing for forest conservation that have been pledged worldwide. Once the full design work is completed our ambition for Belantara is for it to be able to receive international donor funding (alongside co-funding from APP) from both the public and private sector, with governance standards, safeguards and a monitoring, reporting and verification (MRV) system that gives donors confidence their money is being put to good use. Finally, we have also been in consultation with key stakeholders on the new protection-production models being developed, with a view for Belantara to play a role in drawing in market mechanisms such as green bonds.